Why do some patient develop chronic Lyme? A new study may help us understand why some patients get better and other don’t. This topical study: Serum Inflammatory Mediators as Markers of Human Lyme Disease Activity, was published in PLOS one-- the lead authors are from Johns Hopkins University. All published Lyme studies have had problems with patient selection. Patient groups are selected because they are supposed to have the same thing. IDSA criteria are generally used. The group in this study had early Lyme associated with EM rash. As I have discussed previously, most patients with acute Lyme do not present with a rash; and more to the point, most patients with chronic Lyme are not diagnosed in a timely fashion. Nonetheless, this study conveys important information. This study demonstrates the exist of two distinct patient populations who have very different immunological responses to infection with Borrelia burgdorferi (Lyme) – one group has a robust response based on measurements of cytokines and markers of inflammation; the other group has a minimal immunological reaction using the same indicators. The two groups have very different clinical outcomes. I am pleased by a change in verbiage/terminology. In this study the authors use the words PTLDS, post-treatment Lyme disease syndrome, which replaces the old term PLDS, post-Lyme disease syndrome. This small change leaves the door open to the notion that Lyme organisms may persist after treatment. And here we are dealing with acute patients treated early in the course of the illness. The study measures molecules which moderate immune responses. The immune system is tasked with finding offending invaders, like germs, and eradicating them by a host of complex mechanisms and devices. (Seek out and destroy) This study measures the messengers that help direct the traffic of the immune system – sending signals to an assortment of cells, telling them where to go and when. The scientists measures many molecules that traffic immune cells, with names like: CCL1 9, CXCL 19, CXCL 10, CRP, SAA, IL-1a, IL-18, IL33, IL6, TNF alpha, and others. Two distinct responses were identified. On groups showed high levels of these markers of immune response while the other showed low levels of these markers. One particular mediator of inflammation, IL-6 remained elevated in patients with late stage Lyme which the authors found surprising. These patients with post-treatment, symptomatic Lyme disease showed immunological evidence of persistent inflammation – or infection. The group of patient with a high level of reaction (cytokines, chemokines) had lower WBC counts, increased liver function counts and higher levels of markers of inflammation such as CRP. This group produced Lyme antibodies, or seroconverted. This group showed clinical remission. The group with low level reactions to the same molecules did not share these features: these patients had a tendency not to seroconvert. This group of patients was more likely to develop post treatment symptoms like chronic joint pain. This study has clearly identified a subset patient who are more likely to develop chronic Lyme disease even after IDSA recommended treatment for stage one disease. This study sheds light on why many patients are seronegative (do not make antibodies) or have weak IgM responses as we commonly see. This study lays the foundation for the development of a test which helps us predict which patients need more help early on -- those who are at higher risk for developing chronic disease. Another scientist’s face is displayed in a Johns Hopkins University magazine in an article which states he has beliefs contrary to the IDSA and that he believes in Lyme persiters which might respond to a drug for tuberculosis. The article say that while these ideas would not be controversial regarding tuberculosis they are very controversial when mentioned in the context of Lyme disease. People like to hear patient vignettes. Here's one that takes the cake. This is a new patient so I cannot say anything about treatment or outcome. We go back to where it all started. A young woman from rural Massachusetts has always enjoyed spending a lot of time outdoors hiking and camping. She has had innumerable tick bites over a period of years. Her dog suffers with Lyme disease. A few years ago she went camping in Lyme Connecticut of all places. Lyme Connecticut. Over a period of years she developed a progressive illness. She developed a host of symptoms including: migratory joint pains in her: elbows, wrists, hands fingers, knees, ankles and toes. A partial list of other symptoms includes: fatigue, poor endurance, rapid heart beats, anxiety, problems with focus and concentration, memory loss, unclear thinking, short-term memory loss, headaches, changes in vision and hearing, loss of coordination, numbness and tingling, trouble fully emptying her bladder, mood changes, anxiety, agitation and depression. She reported a history of night sweats and air hunger in the past only. A few years ago she had a Lyme test which showed a positive ELISA and a negative Western Blot. This was considered a definite negative. She saw a variety of specialist from New England to New York who variably diagnosed her with fibromyalgia, depression or mixed connective tissue disease. Lyme disease was not the answer according to the best medical minds from the best medical institutions. A more recent Western Blot shows Lyme IgM antibody bands 23 and 41. A C6 peptide test was 2.4. An IFA serological test for Babesia showed a positive reaction to WA1 (AKA) Babesia duncani with a titer of 1:256. Pictures are worth a thousand words. This is what her blood smear looks like. A positive ELISA is usually due to Lyme disease. The other ELISA test usually not done, C6 peptide (which most doctors have never heard of) may provide the answer. Patients rarely develop IgG Lyme Western Blot bands irrespective of how long they have had the disease -- despite repeated promulgations from the IDSA and the CDC. Most US physicians have never heard of Babesia duncani. Last week one of my patients (another patient) showed a picture of a blood smear (taken by me) to a highly trained, university-based rheumatologist. 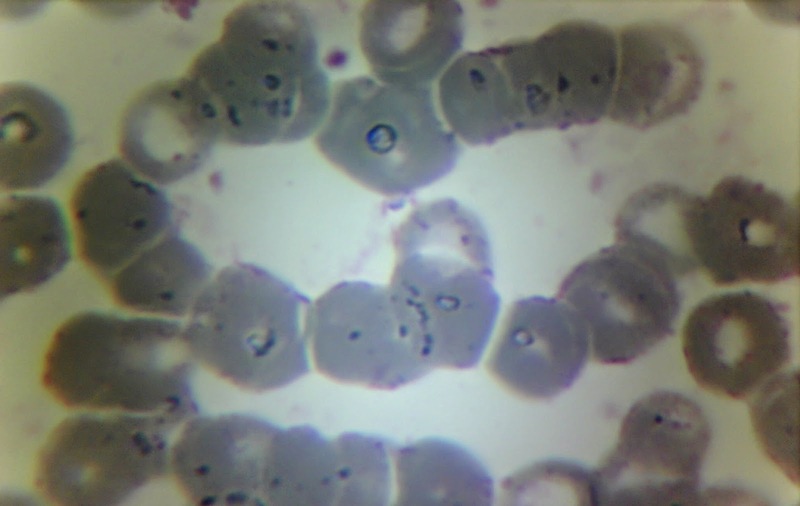 He was captivated by the blood smear so he ordered a test for Babesia divergens. This is a cow pathogen which has crossed over to humans and occurs in Europe only; it is virtually never seen on this side of the Atlantic. By keeping the parasite named WA1 -- even though the organism has had a proper name, B. duncani for more than a decade it feels like its existence is intentionally being kept from the general population of physicians. This name, which is never spoken, is never mentioned at continuing medical education lectures for general physicians. Academic medical experts are so dead-set against the Lyme diagnosis and perhaps B. duncani (since ILADS types always bring it up) -- that even with a history of innumerable tick bites and a history of camping in Lyme Connecticut of all places -- the diagnosis is readily discarded. After all, there was no rash, Lyme is over-diagnosed and anyway chronic Lyme does not exist. To these experts It is clear the patient must suffer with a "real disease" like fibromyalgia. And so it goes. Has Lyme been around thousands of years? Maybe. The spirochete responsible for Lyme, Borrelia burgdorferi was found in a hip bone fragment from the 5300 year old iceman discovered in the permafrost in the Swiss/ Austria Alps 2 decades ago. Illness attributed to the spirochete before the 1970s appears to have been rare; sporadic cases of a relatively mild disease were reported in Europe dating back to the 1800s. Lyme disease and its attendant spirochete were never know in the New World until quite recently, about 40 years ago. The epidemic, for no apparent reason, suddenly appeared in Old Lyme Connecticut the 1970s. Cases of a new disease were reported to The Connecticut State Department of Health in 1975. The acting director of the Preventable Diseases Division in Connecticut discussed these cases with Dr. Steere and Dr Malwesta, rheumatology section Yale University of Medicine. At that time the CDC had something of a storied history. The CDC was founded in 1946 but initially was a small organization with a small staff of engineers and etymologists studying malaria in war torn areas. Epidemiology was added in 1949. Disease surveillance became the cornerstone of the CDC’s mission. With the Korean War the focus changed to bio-warfare. The Public Health Service merged with the CDC in the late 1950s and the CDC took over the Tuskegge study which observed the effects of untreated syphilis on black males. The CDC underplays this on their website, defensively mentioning the words television and the media. The CDC touts its successes: polio, immunizations, small pox, Legionnaires disease, toxic shock syndrome and HIV/AIDS. Lyme is not mentioned. In the mid-1970s, instead of involving the Federal Government, an acting director in public health sought the advice of Dr. Steer, a rheumatology fellow, a doctor still in training. In the initial report 39 children and 12 adults in Old Lyme and East Haddam were reported to have what was described as mild arthritis. Cases mostly occurred in rural and wooded areas. Half the patients had only joint pain while others also complained of fever, headaches, weakness and a rash. An unusual skin lesion was reported in one quarter of the cases. The cause was unknown and thought to be a virus. Historically, many diseases have jumped from one continent to the next; imported by humans. Syphilis was imported the Americas along with Christopher Columbus and other conquistadors from Europe in the late 15th century with devastating consequences. The even more devastating plague of smallpox, another “gift” from the “old word” to the New World was yet to follow. We do not know the origins of Lyme although there is much speculation. Local state departments and the CDC continue to deny the existence of Lyme disease in various locations. I am now seeing a cohort of Lyme patients from central Florida. I have patients who have contracted Lyme disease in such heretofore unlikely of places such as New Mexico. We have a pretty good idea of how Lyme is spread from one community to the next. Migratory patterns of a wide variety of birds. This mode of transmission has been very efficient. Comment: Why did the CDC suddenly increase its estimate of the number of new cases of Lyme disease annually from 30,000 to 300,000? The CDC always knew that the number 30,000, the number of reported cases was a fraction of the true number of cases The majority of cases they count are not reported, cases associated with a rash, treated by primary care physicians. Over 2 million Lyme disease test ordered annually and this is probably and an under-estimation. How many new cases of Lyme are missed, the diagnosis tragically overlooked because the signs and symptoms of the disease were not recognized by treating physicians - or "providers." Seventy five percent of new cases are associated with a rash according to the CDC? The CDC case definition emphasizes the presence of EM rash causing a bias in this manufactured number. The earliest data presented here show that only 25% of patients with acute Lyme recalled a rash. This suggests that no more than 25% of patients with acute Lyme disease present with a rash – not 75%. Unfortunately, as I hear over and over again for my patients, poorly informed physicians tell patients they cannot have Lyme disease since they never had a rash. I sense that the CDC suffers with an identity crisis. What is its mission? Surveillance. Epidemiology. Disease prevention. Aiding doctors in the management of acute and threatening epidemics. Medical research. Coordinating research with NIH. Working with other strategic partners. The CDC has a lot on its plate and seems to be understaffed. What is the basis for its alliance with the Infectious Disease Society of America? Are the IDSA guidelines evidence-based? Are they peer-reviewed? The IDSA guidelines are opinion driven, steeped in politics and certainly not peer-reviewed by any outside organization. The NIH is still busy doing research on this 40 year old, new and emerging and most controversial disease -- how can the CDC pen guidelines written in stone? How can these guidelines be used to deprive physicians of medical licenses and deprive patients of access to care? Sweeping generalizations have been made of the basis of limited studies with tiny numbers of patients through of the eyes of a few biased, academically linked researchers with an axe to grind. We do not know the true incidence of the disease. We do not know how many cases are chronic. We know even less about other tickborne coinfections. Very few physicians have ever heard of Babesia duncani, yet it appears to infect as many as one in three patients with Lyme disease -- not to mention new and emerging species of Bartonella many of which are yet named. The 40-year-olds of today are the first generation of America who suffer with more fatigue, joint pain, disability and impaired quality of life than their parents. What truly is the scope of this hidden epidemic, swept under the rug? And then finally one must ask the questions: who is running the mental hospital? The inmates? Where does this leave all the patients who are yet unable to find answers and frequently greeted with hostility from the very health care providers who should be providing them sympathy and support?